Things seem to be going well for MOG, the online music company that offers both an on-demand streaming music service and a large network of music blogs. In February the company raised another $9.5 million in funding and it has some promising mobile apps slated for release this quarter. Now the company is sharing some of its growth figures and how they compare with the rest of the industry. According to Quantcast, the MOG Music Network, which includes thousands of music blogs written by the MOG community, has grown to 13.2M monthly uniques in the United Sates and 23.7M worldwide. 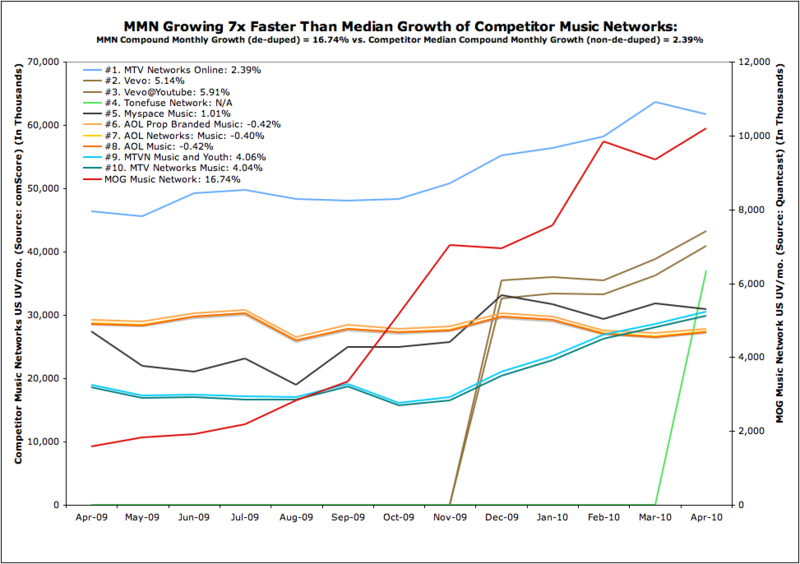 To show how that compares with its competitors, MOG plotted the comScore numbers of other popular music services including MTV Networks Online, Vevo, and MySpace Music versus its own Quantcast stats. It’s not usually a good idea to mix data sources, but MOG says that Quantcast is actually undercounting MOG’s growth relative to comScore, because it doesn’t count ‘duped’ uniques across its network. Note that the Y-axis in this graph is different for MOG — it isn’t nearly as large as most of these competitors yet, but it is growing faster than them. 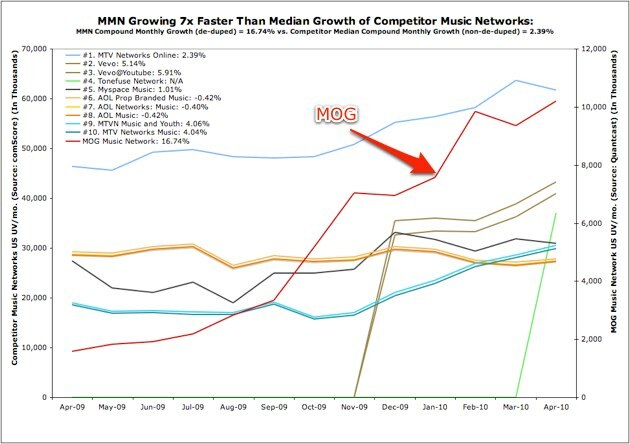 MOG also says that if you combine all the ‘repeat’ comScore properties (in other words, count sites like AOL Prop Brand Music, AOL Network Music, and AOL Music as the same), MOG is up to the 9th largest music portal overall, behind Yahoo’s music properties. To be fair, in some ways this really isn’t an apples-to-apples comparison. The MOG Music Network includes thousands of music blogs, while many of the competitors listed in the graph are focused primarily around listening to music. Most of them have some editorial content too, but not to the extent of MOG’s army of bloggers. Still, comScore puts them all into the same bucket of music sites, and advertisers may not care too much about the differences.